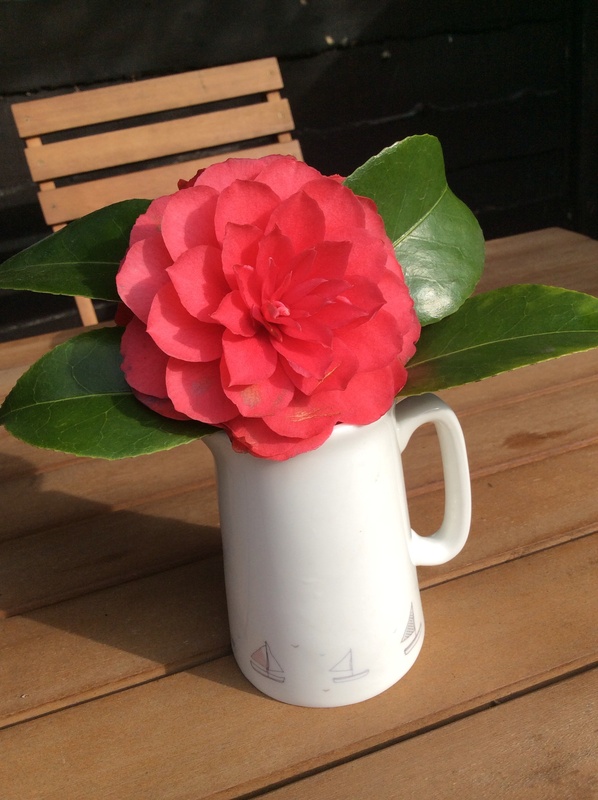 Today’s ‘in a vase on Monday’ is another mini arrangement – two camellia flowers on the same stem. They’re from a four-foot high bush that grows in a pot at the bottom of my garden under the trees. The weather was horrible here on Sunday, so a couple of flowers I had my eye on for an arrangement were blown away – literally. 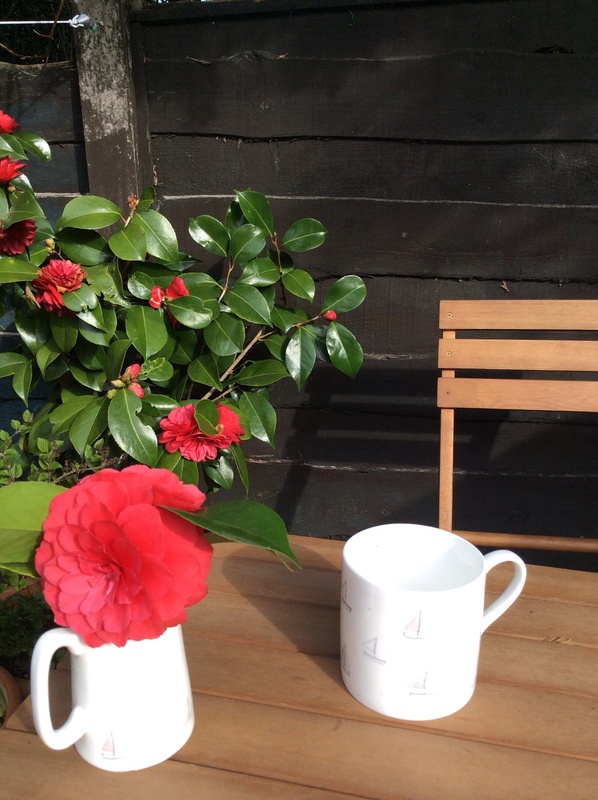 This camellia moved up from my mum’s garden down south last Spring 2014 – another gift (lucky me). Her garden soil (and mine) doesn’t suit camellias which need acid soil; so that’s why it’s in a huge, heavy pot. I wasn’t quite sure if it would be ok with the move north as it’s colder, and rains more, here in Manchester. But it’s settled in well, many buds formed in the late summer and has been flowering for a couple of weeks now. I love the crimson flowers against the dark green, shiny leaves – it’s a double flower variety but I don’t know what kind. I’m hoping someone might be able to tell me. I picked the the jug and mug because it had some red in it and are the right size for the flowers too. I drink a lot of Earl Grey tea from that mug – often on that seat planning adventures. The jug doesn’t get much use as I’m lactose intolerant and my chap puts a drop of milk in his builders tea. 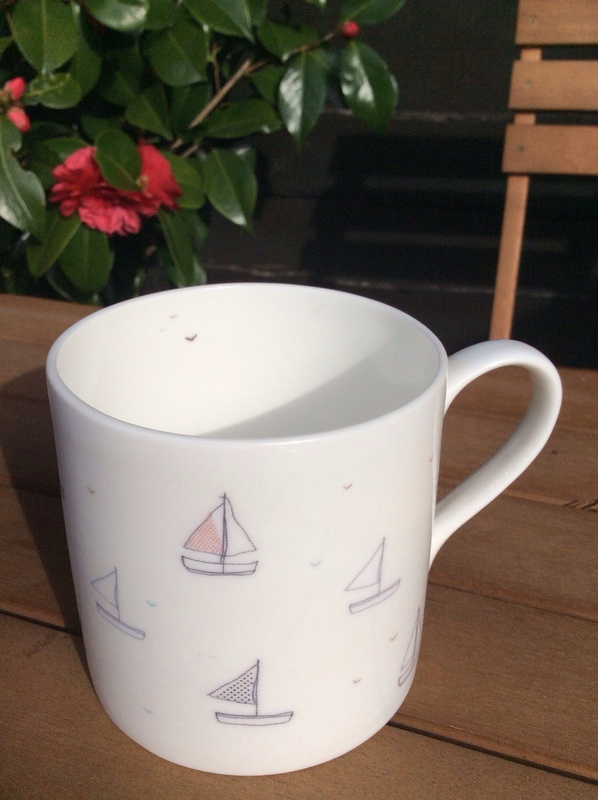 The mug and jug make me smile because I love the sea, being by the sea and sailing too. I used to sail regularly when I was younger,usually on reservoirs, but not so much since I moved to the north nearly 20 years ago. I’m hoping to go sailing later in the year if my plan come together – an adventure! I bought the mug and jug last July in Stroud, in the Cotswolds. My little brother was born there and I haven’t been back for over 40 years. It’ a lovely, quirky town with plenty going on. My chap and I had a great time mooching around for the day. I’ll be back again for a proper visit. Cathy’s hosts this meme over on her blog – https://ramblinginthegarden.wordpress.com/ She’s got a lovely arrangement this week, that made me want to hunt out a book I read a long time ago. I’m really enjoying looking at everyone’s arrangements from around the world, seeing what’s flowering when and plants I couldn’t grow here – even if I wanted too. What’s been flowering where you are? 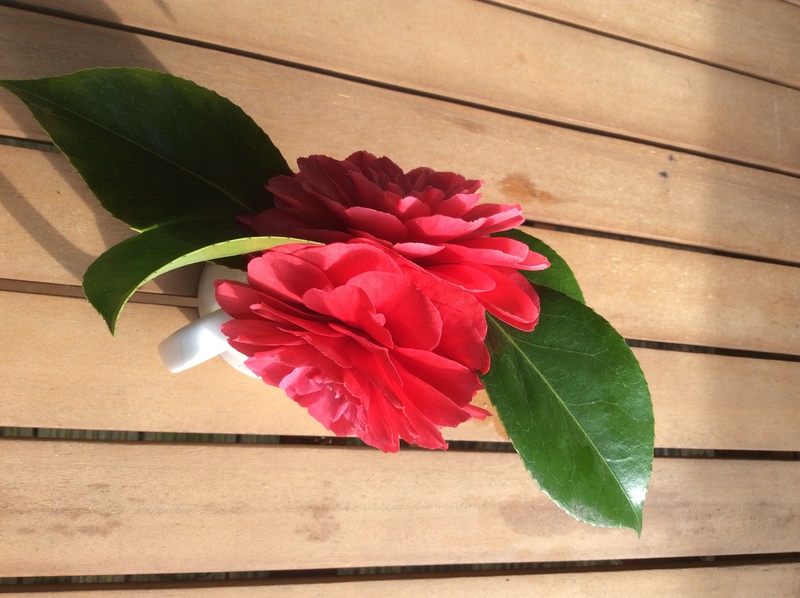 This entry was posted in Gardening, In a vase on Monday and tagged camellia, In a vase on Monday, jug, mug, sailing on April 13, 2015 by Bec - views from my garden bench.